Matthew Dellavedova was born on the 8th September 1990, in Maryborough, Victoria, Australia of Italian and Australian descent, and is probably recognized for being a professional basketball player, who plays in the position of point guard/shooting guard in the National Basketball Association (NBA) for the Milwaukee Bucks. Previously, he played for the Cleveland Cavaliers. He is also known as a member of the Australia national team. His career has been active since 2013. So, have you ever wondered how rich Matthew Dellavedova is, as of early 2017? According to authoritative sources, it has been estimated that the total size of Matthew’s net worth is over $9 million, an amount which has been accumulated through his successful involvement in the sports industry as a professional basketball player; he recently signed a 4-year contract with the Milwaukee Bucks worth over $38 million. 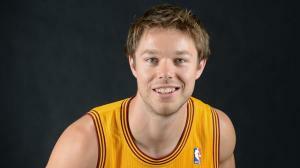 Matthew Dellavedova is the eldest of three children born to Mark and Leanne Dellavedova. He started playing basketball when he was only four years old. He went to Maryborough Regional College, where he was a member of the Maryborough Blazers, a junior team, and he played in the under-12 and under-14 Bendigo Braves squads. Parallel with that, he also played Australian rules football, which he soon quit, as he pursued a career in basketball. In his teens, Matthew was selected for several Victorian state representative basketball sides; however, in 2007 he relocated to Canberra to enroll at the Australian Institute of Sport (AIS) to play basketball in the South East Australian Basketball League (SEABL). Two years later, he was chosen by Saint Mary’s College of California to play for their team, where he distinguished himself as a player, becoming a Senior CLASS Award finalist, and an Academic All-America selection. He finished his college career as the team leader in assists, points, games played, etc. He graduated with a BA degree in Psychology. In no time, Matthew’s professional playing career began, when he became a member of the Cleveland Cavaliers for the 2013 NBA Summer League, after going undrafted in the NBA Draft in 2013. He signed a contract worth $1.3 million over two years with the Cavaliers, which added a considerable amount to his net worth. His best game in that season was against the Detroit Pistons, when he scored 21 points and had 6 assists. In 2014, he re-joined the team for the 2014 NBA Summer League. Unfortunately, he suffered an injury, so he missed out on games, but he returned in December to appear in the game against the Brooklyn Nets. During the following year, Matthew was chosen to compete as a part of the 2015 NBA All-Star weekend in the Rising Stars Challenge, which also increased his net worth. Later that year, he scored a team-high 19 points when they defeated the Chicago Bulls and went to compete for the first time since 2009 at the Conference Finals. When the Cavaliers appeared in the 2015 NBA Finals in the game against the Golden State Warriors, he scored a career-high 20 points; however, they lost. At the beginning of the 2015-2016 season, Matthew re-signed with the Cavaliers, and in the team’s win over the Milwaukee Bucks, he scored 7 points and a career-high 13 assists. His best game in the season was against the Orlando Magic, when he scored 15 points and 9 assists in just 24 minutes of play. Partly thanks to Matthew, the Cavaliers defeated the Toronto Raptors in May at the Eastern Conference Finals, and later in the 2016 NBA Finals they again played the Golden State Warriors, this time defeating them by a margin of 4-3, making an historic comeback from 3-1 down. However, Matthew gained the unwanted award of “dirtiest player in the NBA” in a poll of players, coaches and assistants conducted by the Los Angeles Times in January 2016. In the 2016-2017 season, Matthew was traded to the Milwaukee Bucks, making his debut with the team in October of 2016 in the game against the Charlotte Hornets, when he scored 11 points in 29 minutes. Later, in the win over the Brooklyn Nets, he scored his season-high 18 points. Since then, he has appeared in 30 games, missing only five. His net worth is certainly rising. To speak further of his career, Matthew has also represented his country as a member of the Australian national team at the 2009 FIBA Under-19 World Championship, in the 2012 Olympic Games in London, 2014 World Cup in Spain, and the 2016 Rio Olympics, which increased his net worth considerably. Speaking about his personal life, Matthew Dellavedova has been engaged to Anna Schroeder since September of 2016.